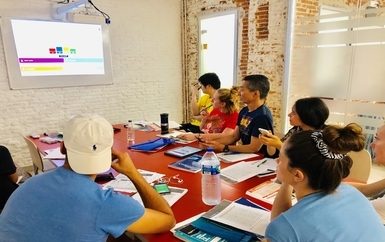 ﻿ Spanish courses in Barcelona. 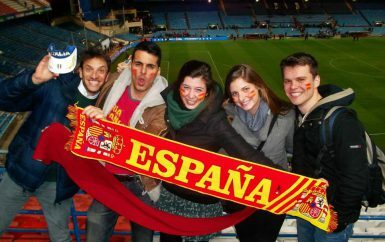 Learn spanish in a multicultural environment. This Spanish course is held from Monday to Friday. It contains 2 lessons of 55 minutes per day, 10 hours per week. 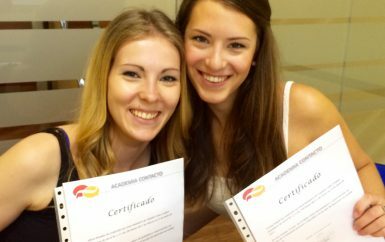 The intensive Spanish course is for all levels and takes place the whole year. This course is held from Monday to Friday. It contains 4 Spanish lessons of 55 minutes per day, 20 hours per week. The intensive course is for all levels and takes place the whole year. This course is held from Monday to Friday. It consists of our Intensive 20 plus 1 individual lesson per day. The intensive 20 + 5 course is for all levels and takes place the whole year. This course is held from Monday to Friday. It consists of our Intensive 20 plus 2 individual lessons per day. The intensive 20 + 10 course is for all levels and takes place the whole year. This individual course is aimed at all those who want to improve their linguistic competence in a particularly effective way and in the shortest possible time. At the beginning of the course your teacher will help you to choose your programme. You can also decide how many hours a week you wish to book, or even ask to share your course with another student. Private lessons can also be taken in addition to other courses. Barcelona is one of Spain’s most attractive and cosmopolitan cities. Few cities can boast such a perfect symbiosis between tradition and modernity, art and history, culture and life. With the sun blazing down, the golden beaches and clear blue sea will be impossible to resist! ´Las Ramblas´, barcelona’s vibrant and lively promenade popular with tourists and locals alike. You will have never seen a region with so many “fiestas” and such strongly rooted traditions. The world-famous nightlife will be hard to forget, and the folklore of Catalonia, with its deep Mediterranean roots, will surprise you by its variety and its originality. Come to our school to share the Catalonians’ way of life. Academia Contacto: the best for you. Our partner school in Barcelona (Linguabarcelona) is located in a stunning 19th Century house on a charming “Pasaje” (without traffic so you can even hear the birds sing) in the heart of the city. Being a mere five minute walk from Plaza Catalunya the school is never more than a stone’s throw from every amazing attraction of this beautiful city, such as Gaudí´s Casa Battló, one of the most important monuments of European modernism. Whilst being a centre of excellence, the school possesses an atmosphere typical of the remarkable city it is engulfed in. You will meet people from all over the world in remarkable settings, say under the palm tree in our gorgeous garden while having a coffee, or in our open-air terrace during Monday´s welcome drinks of Sangria. Accredited by the Cervantes Institute, the school consists of twelve spacious, vibrant and modern classrooms, each fitted with interactive technology, air conditioning and heating. Other services include a terrace, wireless Internet access, coffee and tea facilities, a library, computers, relaxing sofas, disabled access, and dedication from everyone involved. A relaxed atmosphere in which one feels at home is key to mastering a foreign language and culture. Living in one of our carefully selected host families is the best opportunity to experience the Spanish way of life. 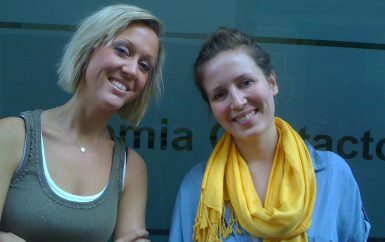 You will improve your knowledge of Spanish culture whilst making new friends! You will also be given your own set of keys, so this is a great opportunity to combine the joy of home comforts with a sense of independence. Undoubtedly one of the best and most popular ways to immerse yourself in Spanish culture through experiencing the hospitality of a Spanish family. Think of it as a relaxed oral class in a comfortable flat with the added bonus of delicious food! All families will have internet connection and will provide bedding and towels. You can choose between living half-board – which includes breakfast and dinner – or with just breakfast included. Double rooms are available for two students that come together, and accommodation in Barcelona runs from Sunday to Saturday. Check out the table below for a breakdown of the accommodation prices! We offer rooms in fully equipped and furnished shared flats close to the language school. We have flats where one or two Spaniards live and flats with just students. This is a great option for those looking for the opportunity to live in a multicultural environment with a variety of different people. 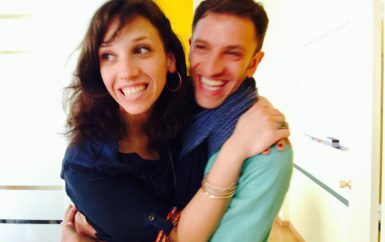 The perfect way to make lifelong friends during your stay in Spain! All flats will be centrally located, within walking distance of the school. All will have internet connection, and there will be no extra costs: electricity, water, internet etc. will all be included in the price. You will share the kitchen, bathroom and living room, and double rooms are available for two students that come together. Please, bring your own towels. We offer two options that vary on ¨comfort¨ and price to accommodate everyone´s financial needs, and accommodation in Barcelona runs from Sunday to Saturday. If you have a preference regarding desired flatmates please let us know! Guided walk in the heart of the city. Thematic city walks and tours along Las Ramblas, the beach, Gothic corner, etc. Football matches at Barcelona´s home ground of Camp Nou. Visits to exhibitions and museums such as Museo Picasso, Fundación Miró, Museo del Modernismo, Museo Nacional de Arte de Cataluña. Trips to the theatre, concerts, other events. Bars, restaurants & club nights with other students. Wine and tapas nights exploring the hidden bars in the less touristic areas. 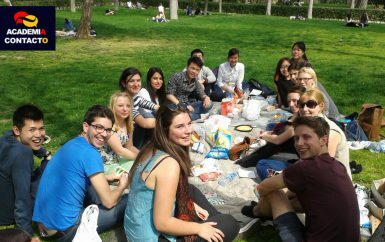 Picnic afternoons every week in the Parc de la Ciutadella. Talks and readings on social, political or historical topics. Free welcome drinks night in the school´s garden every Monday. Half-day trips to the Sagrada Familia, Guell Park and La Pedrera. Whole day excursions (Sat. or Sun.) to Girona; a medieval city sat on the side of a hill. Weekend excursions to other parts of Spain or nearby countries. Guided walks (hikes) and bike tours to Tibidabo with the stunning views of Barcelona from above. You can make a reservation in advance or at short notice. We take care of your accident insurance. We take care of managing your accommodation. You can sign up to get started soon. Books available in four languages. Credit cards accepted for payment. Information and booking of leisure and cultural activities. Varied weekly programme of activities. Language exchanges with native Spanish speakers.